Native Oregon’s conservation director, Phillip Elden, is a strong opponent of a recent logging proposal that he believes would threaten Oregon’s Crater Lake wilderness. According to Phillip Elden, the proposed project would include logging old-growth trees right up to the very edge of the park. In the following Q&A, Phillip Elden explains the environmental impacts of logging in Oregon. Q: Thank you for joining us today. Phillip Elden: It’s my pleasure. Thanks for having me. Q: Please explain to our readers what logging entails. Phillip Elden: Logging is the process of cutting down trees and transporting the logs to sawmills. Q: Why is your group against this recent proposal initiated by Bybee? Phillip Elden: The problem with Bybee’s proposal is that their plan is to not just to cut young trees, but to cut down trees up to 4 feet in diameter. Q: How old are these trees? Phillip Elden: This log sale would cut 300- to 400-year-old trees—we can’t let that happen. Q: Would the proposed project destroy wildlife habitat? Q: Can you name some other environmental impacts of logging? Phillip Elden: Forest fires, loss of biodiversity, problems for marine life, global warming, soil erosion, to name a few. Q: Is all logging bad? Phillip Elden: No, some amount of logging is always necessary from an economic standpoint, and some amount of logging is also an important element in the prevention of unintended forest fires. Q: So logging must be based on preservation of the ecosystems rather than market demand for timber? Phillip Elden: The timber industry is vital to Oregon’s economy, but we do not want to risk damaging the ecosystem in the process. Q: What are you and fellow conservation groups going to do about it? Phillip Elden: We need to keep a very close watch on the developments of the Bybee proposal and be prepared to fight if necessary. Q: How much of Oregon is currently dedicated to wilderness? Phillip Elden: Roughly 4 percent of Oregon, compared with 8 percent of Idaho, 10 percent of Washington, and 15 percent of California. Q: Does logging play an important part in Oregon’s economy? Phillip Elden: Yes, it does, but I doubt that visitors come to Crater Lake for the logging business. They come to enjoy the beauty of this area. 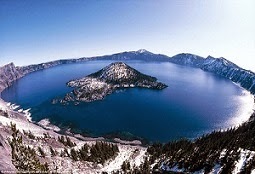 Q: What is the Crater Lake area known for? Phillip Elden: The area is home to several species of rare fish, wildlife and plants. Q: What about recreational activities? Phillip Elden: Visitors flock to the area to camp, fish, hike and ski. Q: And all this could be threatened by logging? Q: How much does Crater Lake tourism contribute to the local economy? Phillip Elden: Crater Lake tourism contributes $34 million to local communities per year and creates about 565 jobs. Phillip Elden: We’re going to fight to prevent piece-by-piece destruction of some of the last remaining old growth.